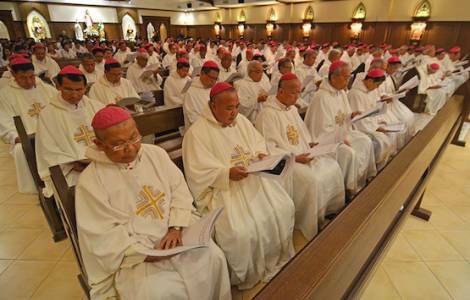 ASIA/PHILIPPINES - Filipino Bishops: "Critical collaboration with the President, without compromise"
Manila (Agenzia Fides) - The Catholic Bishops of the Philippines are willing to continue a "critical collaboration" with the government. After several differences of opinion between the Church and President Rodrigo Duterte in recent months, the Episcopal Conference of the Philippines (CBCP) reiterates that the Catholic Church is ready to collaborate with Duterte’s administration. At the end of its 117th plenary Assembly, the Filipino episcopate has issued a two-page pastoral exhortation entitled "Rejoice and be happy", in which we recall that, throughout the history of the country, the Catholic Church lived and carried out its mission in the presence of various forms of government and collaborated with various leaders. The text, signed by Archbishop Romulo Valles, at the guide of the diocese of Davao and President of the Episcopal Conference, traces a "red line", stating that the Church does not accept any compromise on the fundamental teachings of the Catholic Church. "The Church respects political authority, in particular democratically elected government officials, demanding respect for the basic spiritual and moral principles that are dear to us, such as the sacredness of life, the integrity of creation and the inherent dignity of the human person", said Archbishop Valles, clarifying that the Church works with the government to achieve the goal of the common good, for example in addressing the needs of the most disadvantaged groups in society. Explaining the sense of "critical collaboration", Mgr. Valles said that in some cases there are "shared efforts" while on, some specific questions, collaboration "is not possible because of our spiritual and moral values", that the Church "proposes but does not impose". In such cases, "we can only invoke our right to conscientious objection", observed Valles, recognizing the "constitutional separation between Church and state". The President of the episcopate also had a direct conversation with President Duterte in the presidential Palace to try to dialogue and put in order the recent fractures between the Church and the President, worsened when Duterte, in recent days, publicly issued statements on the "stupidity of God", considered blasphemous. At the end of the meeting, Presidential spokesman Harry Roque spoke of the "President's moratorium on Church declarations". Meanwhile, Valles has asked the faithful to observe a special three-day prayer, accompanied by fasting and almsgiving, from 17 to 19 July, "to invoke God's mercy on those who have blasphemed His holy name, on those who defame and bear false testimony, on those who commit murder or justify murder as a means of fighting crime in our country",he said. The Bishops conclude their pastoral exhortation inviting everyone to always be "builders of peace": "In these times of darkness, when there is so much hatred and violence, while murder has become an almost daily event, when people are so used to exchanging insults and harmful words in social media, we exhort the faithful to remain steadfast in our common vocation and mission, which is to work actively for peace", said Valles.